Samples of workflow diagrams are created with ConceptDraw DIAGRAM v12 diagramming and vector drawing software enhanced with Workflow Diagrams solution from ConceptDraw Solution Park. The ConceptDraw DIAGRAM v12 offers you a variety of diagramming tools, and solutions from the Solution Park provide diagram templates and libraries of ready-made charts and shapes for quick and simple drawing professional-quality business diagrams. ConceptDraw DIAGRAM v12 provides export of vector graphic multipage documents into multiple file formats: vector graphics (SVG, EMF, EPS), bitmap graphics (PNG, JPEG, GIF, BMP, TIFF), web documents (HTML, PDF), PowerPoint presentations (PPT), Adobe Flash (SWF). This example shows a workflow diagram that clearly illustrates stages a business consists of and relations between all parts of business. This example is created using ConceptDraw DIAGRAM diagramming software enhanced with Workflow Diagrams solution from ConceptDraw Solution Park. This example shows a presentation-ready workflow diagram that clearly illustrates how a taxi service works. Workflow Diagrams sample: Paperless contracting. 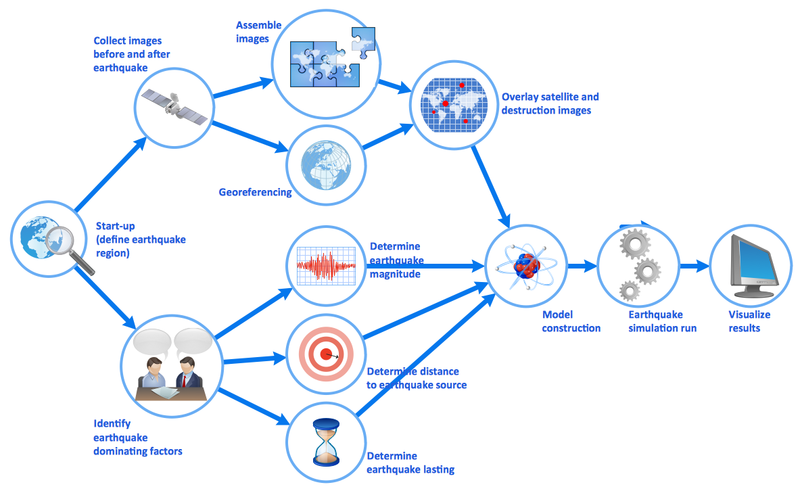 Workflow Diagrams sample: Earthquake disaster assessment. 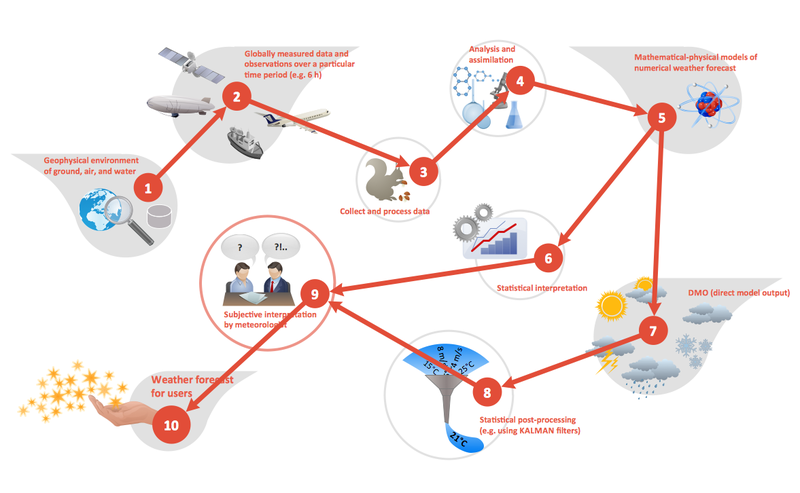 Workflow diagram sample: Weather forecast. This template is created using ConceptDraw DIAGRAM diagramming software enhanced with Workflow Diagrams solution from ConceptDraw Solution Park.